Built by the New York Ship Building Corp., Camden, New Jersey. Keel laid in January 25, 1910; launched in January 14, 1911; commissioned in September 1912. 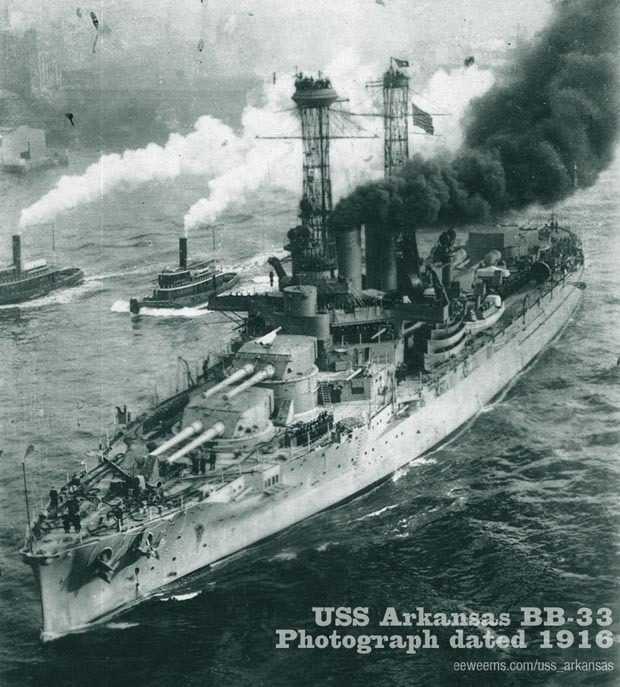 Though classified as a "Wyoming" class vessel, the "Arky" was actually laid down, built and launched before her sister ship the USS Wyoming (which was built in Philadelphia.) These two were the only two ships built of the "Wyoming" class design. Survived the first nuclear explosion test on July 1, 1946, called "Able," as part of Operation Crossroads held at Bikini Atoll in the Marshall Islands of the Pacific Ocean (about 2,400 miles south-west from Honolulu). The "Able" test was an airborne detonation at 528 feet. The "Arky" sank on July 25, 1946, during the second nuclear test, called "Baker" which was a submerged detonation from 90 feet below. The Arkansas now rests upside down in 170 feet of water in the Bikini Atoll lagoon. Read about "Operation Crossroads" at Wikipedia here. Also see the Department of Energy page on The Able and Baker tests here. 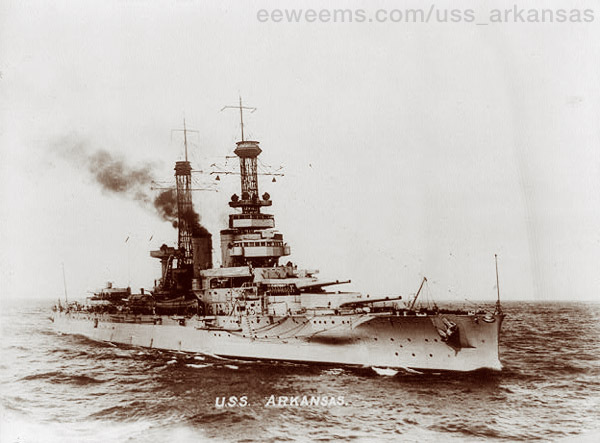 [Below] The USS Arkansas, Picture date approx.1920. Courtesy the Library of Congress.